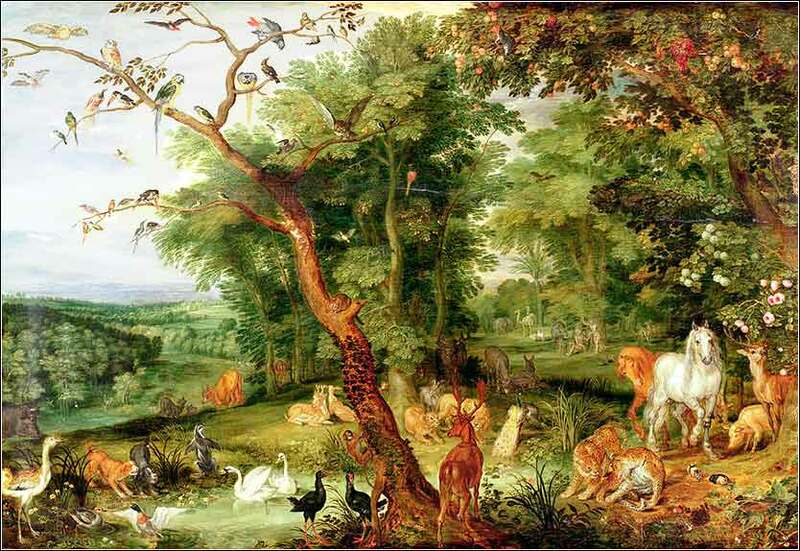 The Garden of Edenby Jan Brueghel the Elder, ca. 1610. 406 people in our community are currently praying with you. The picture is a man named Horatio Spafford, a prominent attorney in Chicago married to the love of his life, Anna Larsen. In 1870, their 4-year-old son died of scarlet fever. Six months later, the Great Fire of Chicago destroyed his entire fortune. Two years later, the ship on which his wife and four remaining children were traveling to England sank; only his wife survived. He wrote this hymn while sailing to his wife in England. The Spaffords lived out the rest of their lives as charity workers in Jerusalem. Give harmony and peace to us and to all who dwell on the earth throughout the week to come, just as you did to our fathers when they reverently “called upon you in faith and trust,” that we may be saved, while we render obedience to your almighty and most excellent name, and give harmony and peace to our rulers and governors on earth. And God said, “Let the earth bring forth living creatures according to their kinds — livestock and creeping things and beasts of the earth according to their kinds.” And it was so. And God made the beasts of the earth according to their kinds and the livestock according to their kinds, and everything that creeps on the ground according to its kind. And God saw that it was good. Never let an evolutionist tell you that God does not exist, that He did not plan for earth's creatures to be made and then execute His plan. Scientists don't know everything, and more to the point, science does not have anything intelligent to say about God. But we must always keep in mind that the Bible does not tell us things, particularly things about the world around us that we can find out for ourselves. Nowhere in the Bible does it tell us that 1 + 1 = 2. But we understand it is true. It simply is not important to our understanding of God and our relationship to Him. There is no reason for any tension or disagreement between science and religion. And once a person has accepted, by faith, that God gave us His holy word for us to learn and follow, so that we might be saved from sin, there is no reason to be defensive simply because science teaches things that the Bible does not. Any time there seems to be a disagreement between the Bible and science, there is a reason for it. Our meager minds may struggle to find it, but we must always remember: The Bible is not a scientific treatise, and a physics textbook is not a religious treatise. Christians who try to take their science from the Bible, and scientists who try to take their knowledge of God from equations, will be equally disappointed at the result. Genesis tells us that on the first day, God separated the light from the darkness. By “day”, does it mean a 24-hour period of the earth's revolution? There is Scriptural authority that we need not take it literally: “With the Lord a day is like a thousand years, and a thousand years are like a day.” (2 Peter 3:8; also see Psalm 90:4) Moreover, what Peter calls “a thousand years” is not meant to be an exact measurement of time, but a general illustration that God is not limited by our sense of time. He could as easily have said “a billion years”. The Bible tells us that God made man by breathing on the dust. This drives an evolutionist nuts, because he thinks he can “prove” that human beings are descendants of lower primates. (This is not to argue that the theory of evolution is right or wrong; it is to argue that it is irrelevant.) But even if he is right — so what? To God, the intermediate details are irrelevant. The Bible and the evolutionist are talking about different things. God made man by putting spirit into matter, that is, by “breathing on the dust”. Genesis seeks to tell us who and why. If the Bible omits intermediate details, it is because they are irrelevant in a book about God and the human soul. 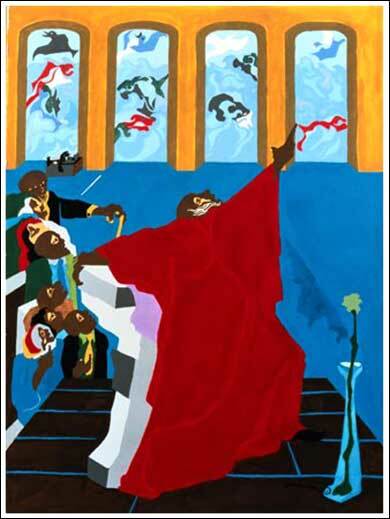 “And God created all the fowl of the air and the fishes of the sea” by Jacob Lawrence, from The First Book of Moses, Called Genesis.1989.